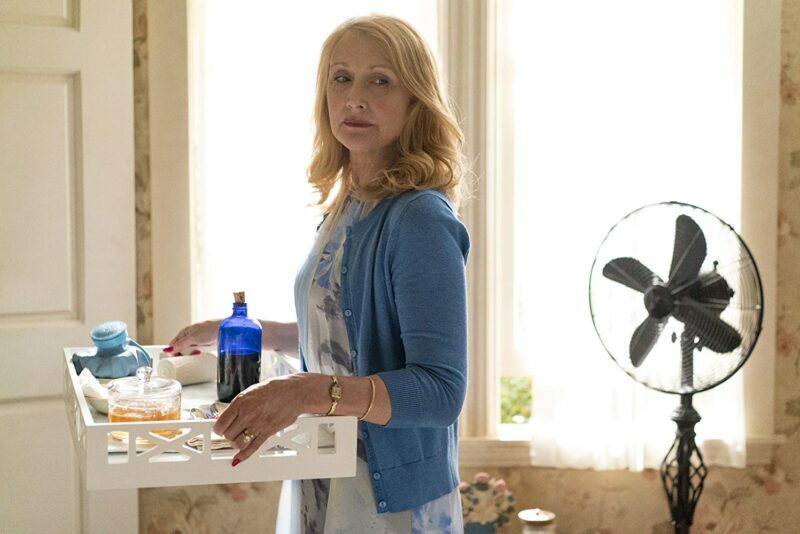 “Falling” is the penultimate episode of the Sharp Objects series. It was written by Gillian Flynn, the author of the book upon which the series is based. An arrest is made, heroes become villains, and we finally learn the truth about Marian’s death. Obligatory spoiler warning: read ahead at your own risk! Camille wakes up the next morning after partying with Amma the night before. She is in her bed, in a white nightgown. Adora is sitting in a rocking chair in the corner, waiting for her to wake up. She has a tray containing an ice pack and what looks like medicine. She gives Camille what looks like jello to prepare her for the medicine. “A little sweet before the bitter. It helps.” When Adora tries to give Camille the medicine, she refuses it, disregards her mother’s pleas to stay in bed and rest, and she gets dressed for the day. Camille then goes to check on Amma, who is in her bedroom. When she walks in, Amma asks, “She gave you the blue?” (The medicine Adora wanted to give Camille was in a blue glass jar.) Camille tells her she didn’t take any. Amma then tells her that John Keene is getting arrested today. Her friend has a cousin who works for a judge and found out through them. Camille drives by John and Ashley’s house, which is now surrounded by police cars. She sees Ashley in the front yard arguing with Chief Vickery about entering her home. “We have a search warrant,” he tells her. He motions to Camille to leave, and she drives away. Beverly admits that she kept a copy of Marian’s records intentionally, hoping they would come in handy one day. She goes on to explain to the detective Munchausen’s by Proxy Syndrome (MbP), a mental condition in which a person makes another person ill, in order to gain sympathy from those around them. It’s most commonly perpetuated by a parent onto their child. Back at the Preaker/Crellin home, Adora walks into Amma’s bedroom with her tray of medicine, including the blue glass jar. Amma tells her that she isn’t really sick and doesn’t need the medicine. Adora claims this must mean that Amma no longer needs her for anything – laundry, cleaning her room, paying for clothes, etc. Adora then begins to dismantle Amma’s grand doll house that is an exact replica of the Preaker/Crellin home. This angers Amma, because she loves the doll house, and she finally agrees to accept the medicine. “It hurts me that you don’t trust me to do the best for you,” Adora tells her daughter. In town, Detective Willis runs into Chief Vickery at the local diner. Willis says that he knows the eyewitness to John’s planting of Ann Nashs’ bike on the Crellin farm can’t have seen anything, because he works during daytime hours, and the bike would have had to be planted after dark. Vickery says it doesn’t matter, because the worker said what was necessary to get them the search warrant for John’s home. Vickery then tells Willis that they did find blood under John and Ashley’s bed. “What do you know about how Marian Crellin died?” Willis asks Vickery. When Vickery disregards his line of questioning, Willis says Marian’s nurse believes something sinister took place. “Is that the same nurse who got fired for malpractice? If you want to help me look for John Keene, that’s fine. Otherwise, you can go home.” Vickery then leaves the diner. Camille is driving through town, looking for other bars in which John could be hiding. He stumbles upon a “bar” which is really someone’s home in an area of town we haven’t seen before. John’s Jeep is parked outside. Inside the house, she sees John and orders him (and her) a double shot. She sits down at his table and asks him what he is doing there. He says that he knows the police are after him, and he can’t return home. He says he would rather kill himself in the woods than get arrested. Camille asks him to tell her his story, whatever it is, that this is his chance to defend himself. He also tells her that his sister’s fingernails were painted when the police found her, and that painting her nails is something Natalie never would have done. And then finally, John says the words, “I didn’t kill my sister,” and Camille says that she believes him. Detective Willis arrives at the hospital to review medical records. (Beverly the nurse has called her friends at the hospital, asking them to help Willis however they can.) He receives a stack of Amma’s medical records and starts flipping through them, once again seeing multiple medical diagnoses, multiple doctors’ names, etc. He sees that she had a g-tube inserted at 6 weeks of age, which allows food to be inserted directly into the stomach, usually in cases where swallowing is difficult or impossible. Camille has brought a very intoxicated John Keene to the local motel to dry out before turning himself in to the cops. Vickery and Willis are now both on their way to the motel, after an anonymous top has given the cops his location. Adora enters Amma’s bedroom to check on her. Amma asks her what she thinks she will be when she grows up. Does she think she’ll have kids? Adora says there is no way to know, because that it years away. “Do you think I’ll grow up?” Amma asks. “Is that why you want me to stay little? So I’ll be like Marian?” Adora tells her that her fever must be getting worse and gives her the last of the “medicine” from the blue glass jar. Adora is mixing another batch of “medicine,” using a mortar and pestle to grind up various pills. She seemingly has all the measuring cups and spoons and elixirs she needs to concoct whatever she wants. The final mixture is poured into the blue glass jar. “How bad?” Alan asks her, seeing what she is doing. “Very bad. Poor thing,” Adora tells him. At this point, Detective Willis and Chief Vickery burst through the door, ready to arrest John. Willis is shocked to find Camille in bed with John, of course. John is handcuffed and read his rights, and Vickery leaves the room so Willis and Camille can talk. She tries to explain herself but fails. She then tells Willis that John isn’t guilty of either murder. He tells her that they found Natalie’s blood under John and Ashley’s bed. They argue some more, and Willis leaves upset. But before he drives off, he leaves Marian’s medical records in Camille’s car. And when Camille sees the folder, she rifles through them and notices that Jackie O’Neill filed numerous requests for information from Marian’s records – years’ worth. Camille rushes to Jackie’s house. She asks a very drunk Jackie why she filed so many requests for information – what was she looking for? Jackie doesn’t answer her but says all of her requests were denied. She then begins talking about Marian’s funeral – how beautiful everything was, how Adora never looked more beautiful than she was on that day. And then she tells Camille that Adora had Marian cremated. This news shocks Camille understandably, because her sister had an open casket funeral. Camille realizes that Jackie (no longer my favorite in this story) has not only confirmed Adora’s abuse of Marian, but that she did nothing to stop it. Jackie said no one would have believed her anyway. Camille runs out of her house and drives off. In her car, Camille calls her boss, Frank, sobbing. She tells him that her mother did it, and that she’s doing it again. And she needs to take care of it. As we set a courtin’/My love fell off to sleep. So I poisoned that dear little girl/’long the banks below. So we aren’t done learning everything after all. Stay tuned for a recap of the final episode of the series, “Milk.” I have a feeling it’s going to be a very wild ride. Trailer for “Alien: Covenant” Released!